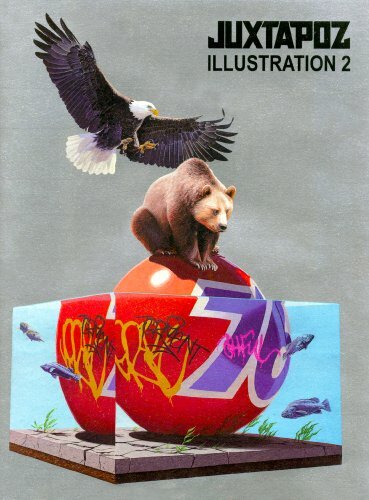 Juxtapoz Illustration volume 2 continues to offer a fine selection of contemporary art. The list of twenty artists included are all new names to me. There's no specific theme the illustrations. The featured art is diverse. Everything is unexpected, like the painting of a battlefield of unicorns, photo collage like that on the cover, a crocodile shedding tears in front of some frogs and dancing tortoises, and some that seem like street art, and many more. It's hard to describe some pieces. It's hard to say if you'll like this the kind of art featured so it's better to preview before buying. Also check out Juxtapoz Magazine for more art. Josh Keys is the artist is on the cover - I'm almost certain that is Acrylic on panel or canvas and not a photo collage. I dont have the book to verify, but you may want to double check. Lovely post. Can you kindly identify the artist for this artwork for me: https://www.flickr.com/photos/teohyc/6809947267/ ? I am in love with the minimal style. Thank you in advance! You're right, that was actually painting. It sure looks photo real. I can only spot it when I look closely. Amazing.